Here is the real humdinger. One person makes $300,000 and marries another who makes $0. They pay $35,000 in State taxes, $25,000 in mortgage interest, $2,000 in charity and have a child. The $300,000 a year earner saves $11,162 a year in taxes. I tried higher than $300,000 a year and the marriage tax credit starts to decline. With the passage of new tax reform for 2018 and beyond, the marriage penalty tax is now practically abolished. 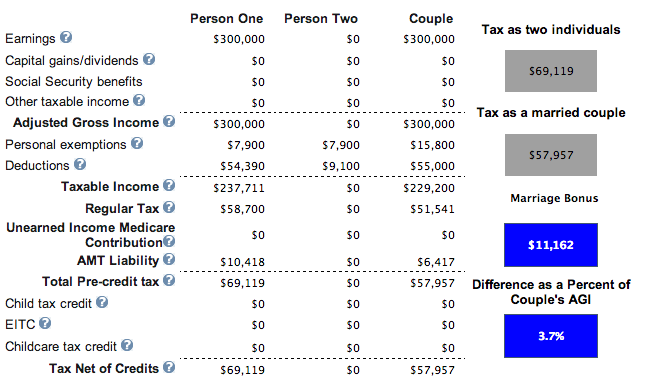 Based on the new federal income tax brackets below, there is tax EQUALITY up until $300,000 per person. In other words, two individuals who make $300,000 and get married for a combined income of $600,000 will pay roughly the same amount of tax (35% – 37% marginal tax rates) as if they were single. Not bad given in the past, they had to pay a 39.6% rate on any income above $470,701. 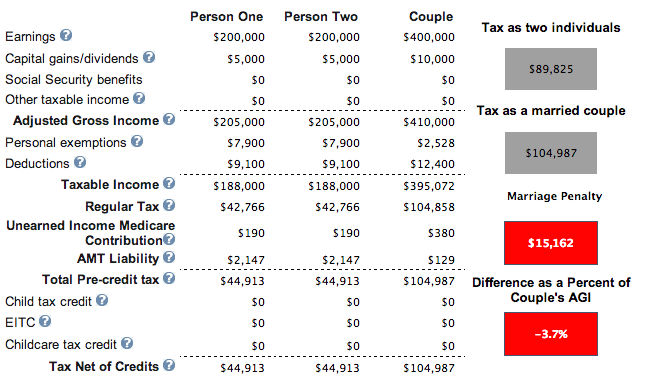 The only visible marriage penalty tax from the chart comes in the form of two individuals making over $500,000 a year. In this case, the marriage penalty tax is 2% X $400,000 = $8,000, which is not much for a $1,000,000+ income family, especially since the past married income threshold was only $470,701+ at a 2.6% higher income rate. So compared to the old tax rule, it’s still a win. Another head scratcher is that the $10,000 SALT deduction does not double to $20,000 if you are married. But the this rule change is most likely due to compromise. Since everyone believes in equality, everybody should be rejoicing at our new federal income tax rates. I personally believe that a married couple earning up to $315,000 after deductions is the ideal income for maximum happiness. You’re paying a 24% federal marginal income tax rate and can pretty much live a comfortable life anywhere in our great country. There’s really no need to slave away to try and make more. Stay On Top Of Your Money: Sign up for Personal Capital, the web’s #1 free wealth management tool to get a better handle on your finances. 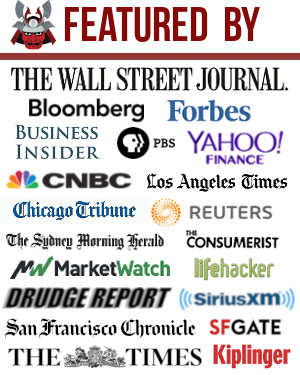 In addition to better money oversight, run your investments through their award-winning Investment Checkup tool to see exactly how much you are paying in fees. I was paying $1,700 a year in fees I had no idea I was paying. 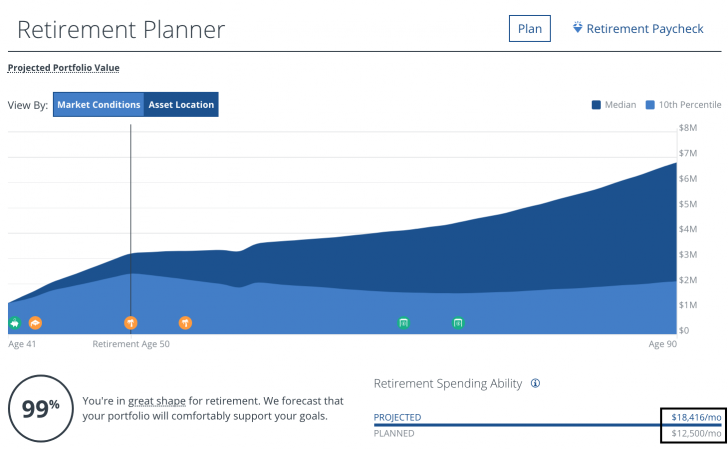 After you link all your accounts, use their Retirement Planning calculator that pulls your real data to give you as pure an estimation of your financial future as possible using Monte Carlo simulation algorithms. Achieving financial freedom is worth it! How about if I’m making 78,000 and my finance is making $650,000? I was wondering if the SALT deduction capping at 10k includes Sales tax too or if that is a separate deduction all together? Thanks! One of my favorite topics, thank you for addressing! I remarried a couple of years ago and we chose to not legalize our union specifically because of the marriage penalty. I learned the first time around. We weighed our marriage penalty (~$30k/yr) vs the economies of scale of shared health insurance ($3500/yr) & gym membership ($2k) and calculated we could come out $25k/yr ahead by not legalizing our marriage. $25k/yr after-tax money! The new changes do help some as you note but taxing 100% of my husbands income at 37% (vs 24.85%), removing his $10k salt etc is still a $25k+/annual tax penalty for us. Never the less, we were UP financially in 2017 by not making our marriage legal and will be up in 2018 and we are happy as clams to have a “private marriage”. It’s interesting however that despite how happy we are personally (and satisfied with our legal dodging of the marriage penalty) some people we know question the strength of our marriage because it isn’t legal. Unfortunately, our culture can’t yet seem to effectively separate a private/religious/personal matter with the legal/tax system. And our tax system cant seem to keep it’s judgments (benefiting the primary wage earner type family) out of our personal lives. Social/cultural acceptance of the privatization of marriage in the US would go a long way to giving tax payers more choice over their financial and tax situation. Why is his income taxed so much higher than before now? In 2017, 100% of his income would have 39.6% plus state of 9.9% because my income would put all of his income at my highest marginal rate. This is in contrast to the ~27%ish federal he would pay as single HoH- he earns about $200k. In 2018 100% of his income would be at 37% as opposed to an est of ~25%. In both instances he would also lose HoH status (we own 3 residences and each have children), his child tax credit, and my ability to consider our 3rd residence where we support grandma a “2nd home”. We both itemize. 2018 limitation of SALT in our high SALT state causes further insult to the marriage tax rate. I had our CPA run the numbers for 2016 and 2017 so I’m confident in what would be our personal net marriage penalty. 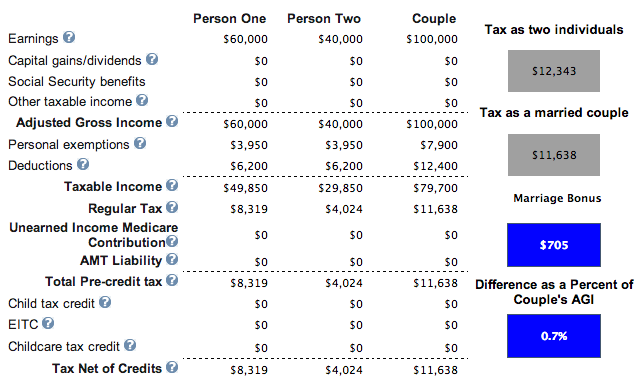 I think the tax foundation calculator underestimates the marriage penalty but I’m not sure exactly how. Ok. Not sure how 100% or his income could be at 39.6% or 37% since that’s the highest marginal income tax rate, but if you or your CPA say so, then that’s all that matters since you’re filing your returns. You know what, you are right, I was totally wrong on the 2018 scenario and using 2017 assumptions. Look at me, jumping on my soap box before I looked close enough at the 2018 table. 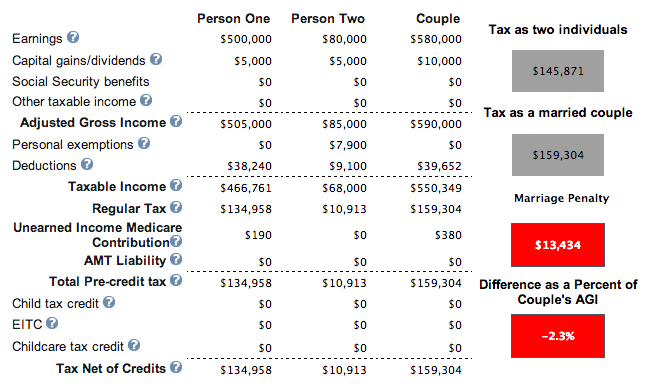 Last year for a married couple, 100% of income over $470,700 was taxed at 39.6%. There wasn’t much of a difference in total taxes paid between married vs. head of household up to $470k. So if one spouse already pushed past $471k, 100% of the 2nd spouses income was taxed at 39.6%. I was placing that assumption on 2018. You are right, the tables impacting the penalty are really different in 2018! Wow. Different game. We’ll have to have our CPA run it again for 2018. You fail to factor in how higher income families got screwed. I would posit that most higher income dual earning families live in higher tax states on the cost. With the recent changes to the tax regulations, we lose the deduction for state income tax and the majority of the deduction for the property tax. So, our AGI will be higher, pushing us into brackets that will make the changes essentially a wash. The heartland is not necessarily low tax. We are high income in KS and pay over 6% income tax. We also pay very high property tax. So now we are looking to leave the Midwest. Oh… being in the top <5% of households in one of the wealthiest countries in the world is ideal?!? I don’t really see how a tax break for the wealthy is such a good thing, especially with the fiscal situation… the wealthy already get a disproportionate amount of special tax breaks (e.g. retirement accounts, lower taxes on capital gains, capital gains exemptions with the sale of a home, caps on inheritance). You mention several times that you want the government out of deciding people’s lives…do you want to lose all of the tax advantages you have used to accumulate wealth in favor of a flat tax? Yes, up to $315,000 for a couple is ideal, depending on where you live. What is your ideal couple income figure? Are retirement accounts like the 401k only available to the wealthy? I’m not sure companies with 401(k)s can discriminate that way, same with the house sale proceeds Etc. If you have been discriminated against with these things, I would definitely bring it up. Always got to fight for equality. One of the reasons we married back in the day, in spite of the marriage penalty, is because there were no “but we’re in looooove” green cards. Rights and responsibilities often balance each other out. One of my frustrations is hearing people talk only of the rights that go along with being married without also discussing the responsibilities. If the marriage penalty has really been eliminated, should we also eliminate spousal social security benefits? I think the correction to the marriage penalty is good. I also think the $10K maximum for Property Tax is a step in the right direction and it should be further reduced over time to a $0 deduction. In fact, I am in favor of simplifying the code and get the Federal Government out of the “deduction business” and tax income without all deductions which are based on peoples’ choices. So, remove the personal deductions based on number of dependents (personal choice), remove the deduction for charity (personal choice), remove the deduction for sales tax (personal choice available to those in states with no state income tax), remove the state income tax deductions (personal spending choice), etc. etc. Taxes are created to influence our choices. Everything is a choice. If you drive a car, you pay gas tax. Unless you’re talking about specifically deductions? IA that simplification of tax code. What about education deductions? Is education a choice in today’s world? Yes, taxes have been created to influence the choices but I was just talking about income taxes and the simplification of that code. I feel if the name is “income tax”, then it should just be on “income”. As far as education, the type of education is a choice and should not be in the income tax discussion. Too many people assume they need 4, 6 and 8 year higher education degrees in fields that are not in demand and when they get out of school, they are in deep debt and can’t find a job in their field that pays well. There are many skilled trade/technical/vocational careers that pay well with less full time educational requirements. well said. i support the “choice” thought process above. We are still better off not marrying, financially. SALT is one reason. 2. My itemized deductions were $24,000 last year so now the two of us together get my itemized deduction and his standard, so that’s 32% of $12,000. 3. This isn’t directly connected but the Administration’s FY19 budget would change the student loan income based repayment program so that you can no longer choose married filing separately and only count the borrower’s income. If I’m grandfathered in, I’m in the clear but some college aged readers wouldn’t be. If we could commit 15% of his income to pay my loans, that would be nice for me, but we can’t for a few reasons. Plus, in some marriages, people keep their finances and obligations separate and that’s okay. Would I say no if he really wanted to get married tomorrow? No, I wouldn’t because I do love him, we have a son, and I’m somewhat traditional, but it’s certainly a reason I’m happy with the status quo now. Thanks for sharing your example. I hope you put that marriage penalty tax savings to good use! Also, it can be interesting to compare on how it is in other countries. For example in France, people prefer to avoid the marriage and go for a pacs which gives more tax advantage and less hassle than a marriage. This is such great news! I got married last year 2017 and currently doing my taxes. I was so mad to find out I got hit with the marriage penalty tax. At least its only for 1 year…. I did get hit pretty hard with the 10K property tax limit. I am SO glad that you pointed this out! I completely agree with you that this been completely overlooked by the media. I just got married last year and we are most similar to Example #1. For 2017, we will be paying ~$20k extra to the government for the privilege of having a piece of paper with our names on it. Had the tax change been announced earlier, we probably would’ve delayed getting married until 2018. In other countries like Canada, taxes are paid individually. The tax bracket doesn’t change based on your marital status. I’m glad the US is finally modernizing its tax code (with respect to marriage). 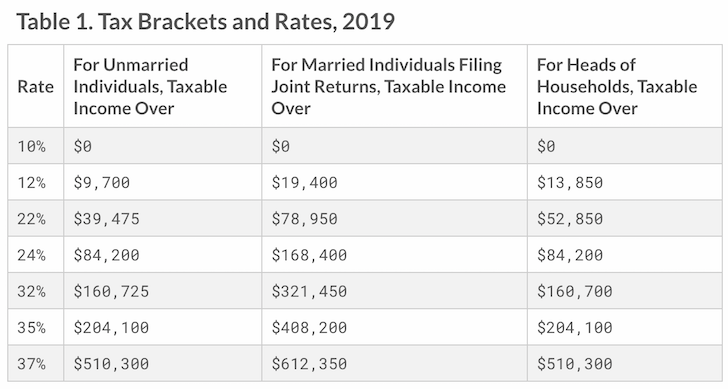 It’s great to see things have pretty much equalized in terms of taxes due for married folks versus single filers. Hopefully the tax rules will maintain this going forward. They needed to be adjusted forever. Your line about getting a divorce if the old rules ever get reinforced made me laugh. It’ll be interesting to see how much tax laws change in the second half of our lives. I sure didn’t care or know much about taxes when I was younger but now I do my best to keep up with the big changes to minimize how much I owe every year. There is one marriage tax penalty that hits married homeowners very hard: SALT deductions. If you are single, you can deduct up to $10k in SALT. If you are married, you can still only deduct up to $10k in SALT. This really hurts married homeowners who live on the coasts, especially when those areas already have high state income taxes. True, but who’s fault is that? Fed doesn’t make some states have high state taxes. Honestly, it’s “generous” that the Fed cares at all how much you pay in state taxes. Logically, it doesn’t make any sense for there to even be a deduction. Why should Fed get less money because a state decides it wants more? Or vice versa in an alternate universe. Great comment. I am tired of media portraying Federal Gov’t as some sort of Pariah for restricting a “Loophole” that favors intrusive progressive liberal, inefficient coastal state gov’ts a free pass to continue excessive anti-American tax and spend policies. It should have been eliminated, not just restricted. I live in the corrupt state of Oregon. OR hates it’s working citizens and puts them below everything else. This state is looking to make healthcare a “right,” cares more about salmon and trees than citizens and makes me pay for abortions for all, including illegal aliens. If changing federal tax code can put some pressure on these insane hard blue states than electing Trump was awesome. MAGA!! Coastal states (in general) incur greater costs to keep government working. People on top of people is always expensive to manage. Hard to imagine people revolting and fleeing major metropolitan areas with whole foods and local fast casual dining at every corner for rural america but maybe Amazon and others can even the playing field a little. Personally – I’d love to recede from coast if I could still get my gourmet food delivered and get my kids into good schools. I think it’s great that their is tax equality for married couples for the ones that make $300K each, always nice to have equality in any level. In terms of getting married or not based on the tax penalty, I don’t think it’s a huge factor since other ones like personality and be compatible are probably more important. There are still marriage penalties on deductions for IRAs and eligibility for contributing to a Roth IRA. I believe most of the other deductions phase out at levels that do not double for couples. So the marriage tax lives on in the phase out limits. But I agree it is much better than it was. Still need to get rid of amt though. “Discrimination” is really not a useful lens to look at this through. Coming up with uniform tax rules that make people pay their fair share without inflicting undue hardship on too many people is difficult. Different people are situated differently and the tax code necessarily “discriminates” (i.e., applies different rules to different situations) in some respects. It’s unavoidable, even when the goal isn’t to do social engineering about the “best” kind of living arrangements. The old system implicitly subsidized families on a model that was more socially normative half a century ago, one primary breadwinner (usually dad) married to a spouse who’s either not in paid employment or in lower-paid employment (usually mom). Really not that different from allowing a dependent exemption for a non-disabled, non-working spouse, like the tax code does for children. The new system still shafts that doctor-lawyer power couple due to the top bracket ending for singles at $500K and marrieds at $600K, but the “discriminatory” judgment there is that couples who are making that kind of coin can afford the tax hit. It also creates new incentives around the margins for married couples at lower income levels to have both spouses working, because the tax “roof” before their combined income puts them into a higher marginal rate bracket jumps up higher, which effectively means the second working spouse’s after-tax wages are higher. In that sense, the new system “discriminates” against one-income families and subsidizes (“discriminates” in favor of) two-income families. Subject of course to Sam’s very correct disclaimer that it’s complicated, and incentives work at the margins rather than in every case. One can spin all kinds of tales of moralizing resentment about how the old system “punished women who work” or the new one “pushes women out of the home” or it’s “discrimination” against somebody. Treating what is unequal as if equal is bad, treating what is equal as if unequal is bad, the problem is you’re never going to get agreement on what’s equal and what’s not. I think it’s great that the marriage tax has been remedied. Now we should actually take it a step further and offer a increasing scale of credits based on years married. At the end of your podcast, you asked if we want the gov’t getting involved in our personal lives. I think it’s inevitable that they do and will continue to do so. I think it’d be better for the gov’t to encourage citizens to get married and stay married …. and have children (as they already do with the child tax credit). The more robust our natural growth rate and the more financially stable and strong American family units are, the better our economy will be. I think there’s lots of other benefits to local communities and society at large from this too. I think it was in one of your email newsletters that you mentioned you seeing the stock market continuing to go up this year because the only thing that had changed at that moment was a higher bond yield. It looks like you were right since the market is soaring from a week ago. When I saw the stock declines, I didn’t think they would stay down for long either but my reasoning was based on the tax cuts that the middle class received. Most people saw their paychecks go up by 3%-4% which means more money in their pockets for spending. A single middle income earner would have anywhere from $117-$467 more per month for spending. As I learned from my college economics class, it’s consumerism that keeps the economy healthy! Too early to tell whether I’m right or wrong. But over the long term, I hope I’m right. Hopefully American laborers really are seeing a difference in their paychecks now with tax cuts. The Michigan consumer confidence index surged to 99, from expectations of around 95-96 for February. Not bad! I’m not sure I agree with you that a couple making $315,000 a year is the ideal income for maximum happiness. Why would you be less happy if you made more than that? Say you make $500,000 instead. You’re only going to pay an extra 3% on $100,000. Are you saying that you’re less happy paying higher marginal taxes? It’s not like your entire income would be taxed at the higher bracket. You would have more disposable income with a higher salary even if you are paying a little more in taxes. Jeff, I think the rationale Sam is using is the point of diminishing returns. He is not saying you will be LESS happy if you make more than 315K after deductions; he is saying you just won’t be that much MORE happy by making more because, on average, most of what you would want can be acquired at the 315K income level living in most parts of the country. Sam’s conjecture, the amount of additional happiness you acquire does not correspond 1:1 with the rising level of income beyond this point. My understanding is the penalty is also still in full effect for AMT. I want to guess the reason for the penalty was the belief that shared costs are reduced across two people and that people who share costs would ultimately get married. Not saying I agree. But as I understand, far fewer of us will be paying AMT under the new law. I did a quick check, and about 60% of filers in the $200k-$500k range (ie. my household) pay AMT. I couldn’t find new numbers, but everything predicts it’s going to be much lower. The major reason for AMT was state and local income/property taxes. Since that deduction is capped at $10,000 far far FAR fewer people will be subject to the bite. If you stay single and file separately you both get the 10,000 deduction cap for s.a.l.t. Married filing joint or separate can only deduct 10,000 or 5000 I believe so there is still somewhat of a penalty correct? Correct. It’s stupid that a married couple doesn’t get $10,000 X 2 = $20,000 of SALT deduction. Not sure what the government’s logic is on this one. Perhaps the logic is now that the marriage penalty tax is abolished, the benefits outweigh the benefits of doubling SALT. Losing $10,000 of SALT deduction is $2,400 for a 24% tax bracket couple, but the income tax savings is greater. Is there still the marriage tax related to the 0.9% extra medicare tax (single pay over $200k income and married over $250k) or was that modified with the new tax plan? Completely agree on the 315k maximum hallow was figure. We are switching to a Roth 401k to pull as much income into the 24% bracket as possible. It wasn’t about logic, it was about a compromise. Remember, the original plan was to get rid of the SALT deduction entirely, because it doesn’t actually make sense for federal revenues to go up or down based on what states decide to do with their taxes. CA deciding they need more money shouldn’t mean the government gets less. Good point about compromise. With a nation divided, compromise is the only way to get things done. Thoughtful response. We fall into bucket 1. I’m not happy one of us loses our SALT but at least net/net the marriage tax is reduced. Our SALT impact is mainly a loss of deducting state property taxes where we have a home value comfortably above the average. I rationalize it as a luxury penalty and I’m OK with that considering the convenience we derive from the location for both of us to work in very good jobs. The government got this one right in my book. Thanks for the analysis, Sam. I don’t remember seeing this highlighted in the media, which is surprising, given I would think the marriage penalty would have been seen by the public as unpopular. Biased media? This is a big deal to me. We fall somewhere near example 1, and while I knew the penalty was probably large, I don’t think I knew it was quite that large. More important than just the dollar impact, the whole idea of the penalty is, to me, massively unfair. Much has been written about the societal benefits of marriage (especially on children), and yet you throw a stiff penalty at people for playing by the rules and making responsible choices? This wouldn’t be highlighted in the media (at least for positive reasons) because look at the numbers used in this post… e.g., two couples making over $200K each. The majority of this country WANTS this exact couple to may more in taxes, not less. Highlighting these examples would garner less support for the tax bill than it already did for ‘helping the rich’. Yes, I’m in the camp that the government should treat people equally, change their old ways of thinking about how one spouse should always stay at home, and get out of the business of deciding what individuals should and should not do with their lives. I don’t know why the mass media and more people aren’t talking about the marriage penalty tax abolishment. This is GREAT for equality. Perhaps nobody has come to this logical conclusion about what the new 2018 federal income tax brackets mean? Is it possible folks can’t think in derivatives except me? Doubtful, but maybe! It is Valentine’s week after all. If one spouse makes 300k and the other only makes 30k, the one who makes 30k is still taxed at the 300k rate…..so why are you saying the “penalty” is gone? Unless I’m messing up the math, this is the type of couple who would really benefit. The single person earning 300K is taxed at 35% on taxable income from 200K to 300K. When they get married, 200K – 315K is only taxed at 24% and the final 15K is taxed at 32%. I pay a marriage tax but it’s mostly because I would qualify as a head of household (higher standard deduction/tax bracket threshold than single) and get the full dependent credits. Wait until you see how gains are treated when you have your own business. That pass through rate gets reduced. A nice, little hidden surprise my CPA wife just found that will hurt us. Want to share an example with numbers to clarify what you mean? Well, it depends what your self-employed income level is compared to your spouse’s earnings. If she earns more than less than $150,000 and your business income is MORE than $150,000 then you win! The losing scenario is your business income produces taxable income of $150,000 and your wife has taxable income of $250,000. In this case, you lose the pass through deduction because your joint taxable income is too high. The penalty could be around $6,000. Nice post, Sam. Mrs. BD and I are happy overall with this aspect of the recent tax changes. – Being a single guy with one job, no kids (i.e., dependents), no house, and no other financial obligations, I had a very easy tax situation the first few years out of college. I’d fire up TurboTax, have a beer, and get my filing done in no time. – Getting married changed that slightly. I just didn’t like the impact of now having higher income and the net result on our return. Alas, I thought I had an option. TurboTax asked something about whether or not I was married on or before December 31 that year. – I read that to be a “no” because we didn’t get married on December 31. I interpreted this to mean, “If you’d like, you can still file as SINGLE for the year you actually got married.” Oops. That was an mistake I won’t forget (and my wife likes to remind me of it each year :) ). It’s good to not forget you’re married. well written article. Just another benefit of the new tax plan. Very interesting. Honestly, between being young/early in my career and not as financially savvy, I didn’t really pay much attention to the tax implications of marriage. But looking at the scenarios, we were (and still are) not exactly in the “high-income bracket” as defined here. Thank you for sharing the new stats! Anyway, I think it’s good. More equality is nice. Now we just need better equality in pay scale. Equality for individuals or equality for couples? This is one of those iron triangles. You can’t have a progressive tax system, individual tax equality, and tax equality for couples at the same time. Sure can. Just treat every individual the same regardless of their marital status. What is your belief? Individuals should have equality but couples should not? If not, why? When you say “equality”, are you referring to dollar proportion, or impact? A married couple likely does not have twice the expense that two individuals would. How much should that be accounted for in tax code? Essentially, how much are you considering marginal utility? It shouldn’t be accounted for at all. You don’t have to be married to live in a multiple-person income household anyway – having a roommate or roommates is a decision available to everyone who wants to save money. If you want to live alone, you pay more. Call it a privacy premium. When it comes to taxation, we’re already taxed at higher rates the more our income goes up. For couples vs. singles, it’s not that hard to see that one person making $200,000 plus another making $200,000 vs. a couple making $400,000 are not equivalent. A couple benefits from the economies of scale. Two single people who live apart need to each have their own housing, each purchase their own food, each pay their own heating bill, each pay their own electric bill, each have their own vehicle, etc. Yet if they get married and move in together, they now only need one place to live, pay one set of home maintenance costs, have the option to have and share one vehicle vs. two, etc. In other words, a couple’s resource scale better when they live together in a way that just isn’t possible when they are two people living apart. The costs are also non-linear; whereas one person plus one person both have to eat and pay grocery bills separately, if you buy higher amounts for a family of two, you end up paying less per per person because of discounts for purchasing more of one particular item. If they do have the same living expenses before as after, it’s as a result of conspicuous consumption (and governments have always taxed consumption), or perhaps they are investing surplus income (e.g., in a second house as a rental) in which case they can afford higher tax rates. From a standard-of-living perspective, the reality is that two scale better than one and your costs don’t double when you marry and live together. It’s therefore not a surprise that the tax system would reflect this. Makes sense. I agree with the logic, but where do we draw the line with what the gov’t should meddle with? Hence, perhaps life is much better being with someone than being alone. What about cohabitation? Why would they be exempt? I might be missing something but the fact that the SALT deduction is $10,000 whether you are single or married (i.e, it doesn’t double to $20,000 for couples) is sort of a marriage penalty and probably impacts a fair number of couples with moderate to high incomes who own a home with a mortgage where a $20K SALT deduction combined with mortgage interest would allow them to itemize and realize tax savings from other deductions like charitable contributions as well. Yep! And you’re not missing anything. You are completely right. The majority of middle to upper middle class couples that both work, have property, etc are affected by this. How big the affect is dependent on how much they’re getting taxed, where they live, etc. But as a common example, couple earning 200k total, living in a high local tax state, paying 10-25k in property taxes. Losing that additional 10k deduction is equal to at least 24% of that 10k which is likely 2 weeks net pay. I would get legally married even with the tax penalty for religious reasons. But I’m sure glad I don’t have to pay a penalty now. The assumption that women did not work or worked some low paying job was a cultural assumption that got embedded in the tax code, and while the culture has changed, it stuck around in the tax code. Now that it’s gone, I think that change will stick. The estate tax comes and goes. Deductions come and go. Brackets and rate change. But it would be politically very bad to go back to the way things were on this. Whoever supported a marriage penalty would be accused of discrimination for writing into law that women shouldn’t work. So, this is a change that I think will be hard to undo. I’m very curious about your comment, “I would legally get married even with the tax penalty for religious reasons”. Many religions uncouple the two constructs- marriage in the eye of God and marriage in the eye of the state- which religion requires legal (and in some cases tax penalizing) marriage? Great news! Not that it effected us before. We were the humdinger example at #4. If one wanted to count pennies, the double home dinger is having a spouse that also run airbnb/is self employed (from $18k to $40k/year) so they get to stuff their own 401k :) hehe. Secrets out! Would love to have article on rental property/air bnb related tax write-offs/deductions, “stuffing 401k” as self employed (I assume S corp setup is necessary). For those here…likely already maxed their 401k at employer so you can’t do another 18k as self employed right?